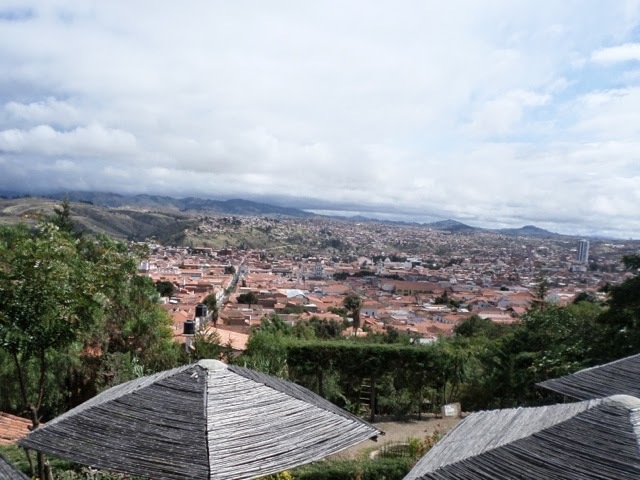 After the world’s worst overnight bus we finally arrived in Sucre, only four hours late. The bus was boiling hot, had no toilet and a baby that was screaming nonstop, argh! There was also a head-on accident between a between a bus and a car and the car was pretty obliterated. We arrived on Easter Sunday, happy belated Easter everyone, I hope you’re all saving me lots of lovely Easter eggs for my return! After reaching the hotel and having a refreshing shower, we emerged in a semi zombie state to do our orientation walk. Sucre is the official Capitol of Bolivia and is also a UNESCO world heritage site, which is nice as it prevents over development in the historical centre. The city is also nicknamed the white city, like Arequipa, although for different reasons. Here it is due to the whitewashing of the buildings, rather than the actual colour of the building stone. We checked out the main square, Plaza 25 de Mayo, with the Bolivian centre of justice and the main cathedral, Iglesia de le Merced. The main cathedral was emptying from a service as we went in and it was very busy. The interior was quite different from other cathedrals we have visited so far, still very white and gold but far plainer and simpler. The interior was actually redone removing the Andean baroque style and redecorating in a more modern ‘classical’ style. It actually made a nice change. 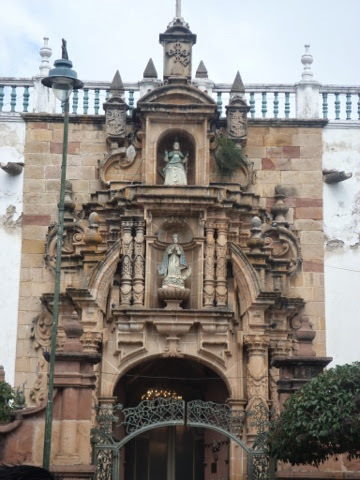 Here we also saw that representations of Jesus on the cross show him looking down to Pacha Mama rather than upwards to heaven, as we saw in Cuzco and La Paz. View of centre of justice. Frontage to the cathedral, Iglesia de la Merced. 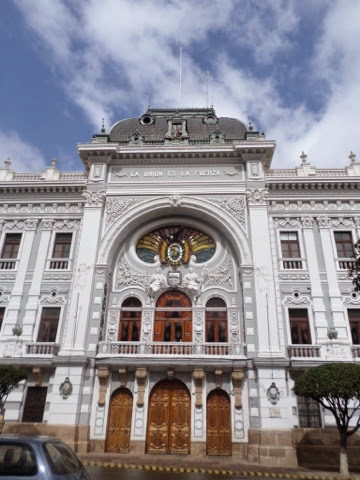 Although the entrance is still in the Andean Baroque style, the interior is far more modern. As we were all pretty tired and unenthusiastic we headed up the hill through the town up to an area by the cemetery called Recoleta. As Sucre is at 2700m is isn’t particularly high up compared to many of the places we have stayed but the uphill walk, steps and general tiredness made it a bit of an effort for everyone. It was worth it though. When we reached the top there was a lovely cafe with deck chairs, sun umbrellas and panoramic views of the city. In the square behind the cafe there had been a big party the night before and lots of drunken and hung-over people were still around, obviously part of their Easter celebrations! Over coffee we had Easter eggs and enjoyed the sunshine. We then wandered back into town for a lazy lunch. 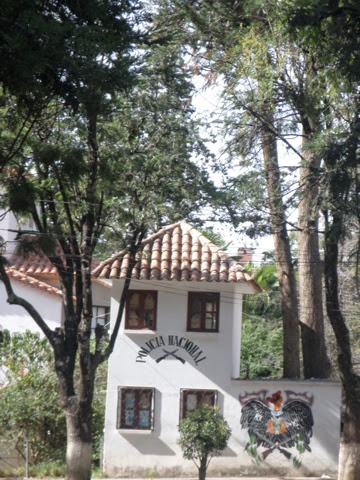 That afternoon we walked to Parque Bolivar, in the South of the town. The park was very busy and it was nice to see so many families and kids out, also a lot of young couples. Sucre feels like a very young town and I guess this is due to the universities being located here. There were lots of food stands, with cakes absolutely swarming with bees, although this wasn’t stopping people from buying cake! They also had lots of mini cars and small fairground rides for the children. 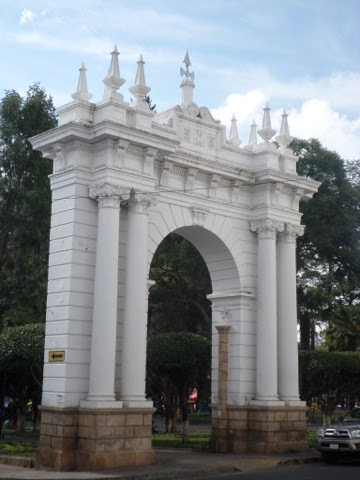 At the entrance to the park are two large white arches. In the middle of the park is a hilarious miniature Eiffel Tower, which you can climb up, although it’s only about 10 steps. It was built by a local man who thought it would help him get closer to a comet! It was a bit bizarre to be honest. The park was quite nice, we found a sunny spot and chilled out on the grass for a while. We did some crosswords together which was fun, although made me feel like my brain is dying and caught up on diary writing, which is getting horribly behind! There was also a nice fountain, although it only went off randomly for a short while. It was so nice to just stop and relax in the sunshine and not feel like we had to be anywhere! That night we attended the evening Easter Mass service at the local church, the Iglesia SanDomingo. I have never actually attended a catholic service before and it was really interesting. We didn’t get given Hymn books, which I remember is usual, but still a bit disappointing as I love singing along and was looking forward to trying out singing hymns in Spanish. It was interesting that I was able to still follow quite a lot of the sermon, although this was probably due to being familiar with the material and knowing what to expect. It’s good to realise how many Spanish words you can understand, even if you can’t use them yourself! There was a really nice musical group including the Spanish guitar and a woman with a lovely voice. I also really liked the fact that there were several incantatum, although we didn’t know any of the responses. The locals took their palm offerings for blessings and after prayers we headed out. It was a really nice service from what we could grasp and it was a really nice experience, as I haven’t been to church in a long time. That night there wasn’t a lot open so we had dinner at a traveller cafe. I had a great chilli con carne, a very traditional Easter meal… We washed down dinner with a few bottles of Bolivian red and it was the perfect end to a great evening. The following day we headed out to be greeted by people dressed up as Zebras and Donkeys at the road crossings. We had also seen lots of pictures of Zebras on the walls in La Paz and had wandered what it was all about. The scheme employs street children between 18-21 years old to dress up. The Zebras indicate to people when to cross the roads safely. The donkeys chase and make fun of people who are crossing incorrectly or dangerously. Its run during the hours when children are travelling to or from school and it’s been so successful that it now runs in multiple cities. I think it’s a great idea as it gets street kids into paid employment and offers them a future and also engages young children in a way they would respond to. It’s also pretty funny to watch! Luckily none of us got ‘donkeyed’. 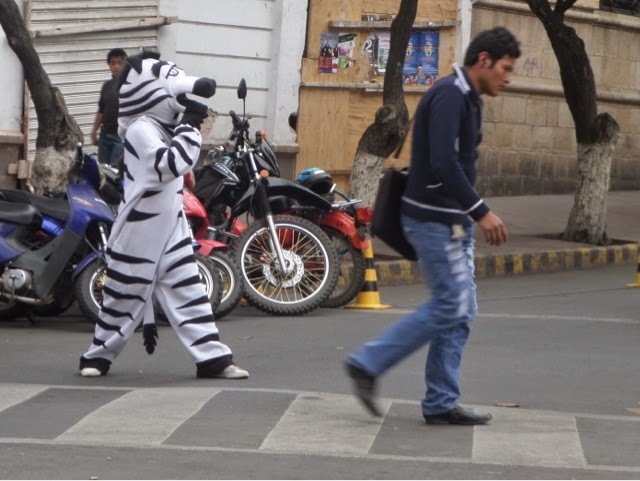 A zebra helping people cross the road. We then headed out to a site called Cal Orcko to see dinosaur footprints. We went by taxi as the ‘Dinobus’ was unfortunately not running, boo! The drive was pretty bad actually with the worst roads I have seen here since the death road! It was slightly strange as you access the site through a cement works. In fact the site belongs to the factory and was discovered by workers about 20 years ago. The footprints are located on a wide exposure of mudstone which is basically a quarried cliff face and is actually at 72 degrees. 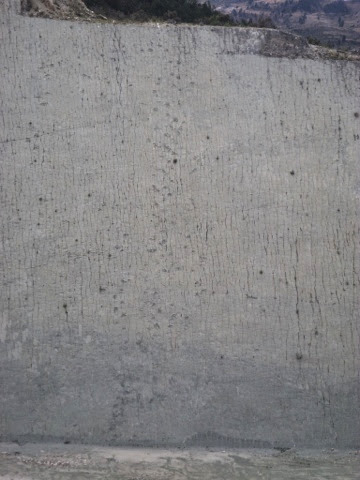 It’s really cool you can see tracks of footprints running all over the wall. 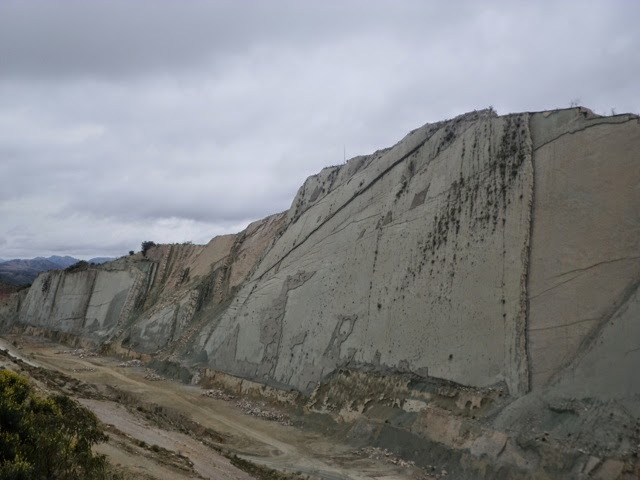 The cement works are located there as there are limestone deposits associated with marine transgression of what is now Bolivia, by the Atlantic Ocean, when Bolivia was part of Gondwana. The site area used to be part of a shallow lake system and was a watering hole for the animal life of the time…. Dinosaurs. South America was home to a large population of enormous sized dinosaurs in the Cretaceous. This included a wide variety of carnivorous, omnivorous and herbivorous dinosaurs. 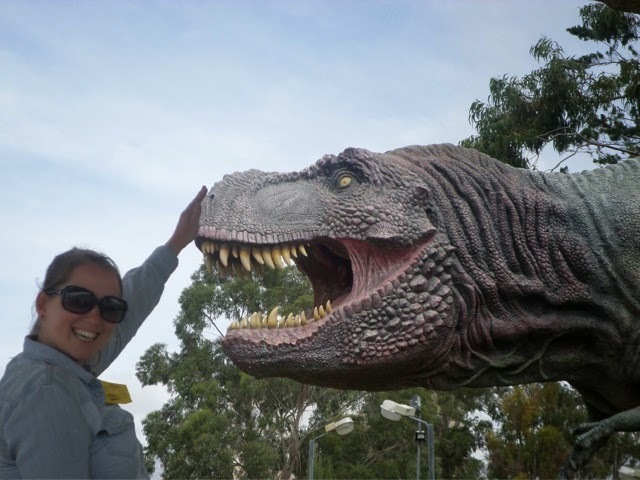 Importantly the main carnivore species was not T Rex here, although they look very similar, they actually have different teeth. Due to the range in species you can see all three footprint types associated with the different groups. The scientists believe that four distinct groups were present in the area from analysis of the footprints. You can see the slimmer elongated toed footprints, with the long middle toe, which belong to carnivorous species. There are also the rounder flatter footprints associated with omnivorous and herbivorous species, both two and four legged. These are larger and more easily identifiable on the exposure. One thing that seems a bit of a shame is that the exposure is not stable and sections keep collapsing, this is why tourists are not allowed up close anymore. Sections keep collapsing and they lose the footprints from the layer which falls down, which is a huge loss to science. They are least doing regular 3D surveys of the site though to record what is there. In some ways collapse of the layers is also interesting as it is exposing older layers underneath that are also covered in footprints of different, older species. It is a shame in a way that there isn’t a way to carefully systematically remove layers to be further analysed and preserved. Although that would be an enormous job! The tracks include four separate groups, headed in multiple directions. View across to the exposure. You can only get to within 300m of the wall, although there are lots of telescopes so you can see the footprints more clearly. It’s pretty easy to see most of them by eye though. The wall actually runs for around 1.5km in length and is the longest exposure of tracks ever discovered. It was totally awesome! The scientists actually abseil down the wall to do their work! They had loads of super cheesy and totally amazing life size models of different dinosaurs at the park, it was brilliant, and I totally loved it! Mega geeky but so so awesome! 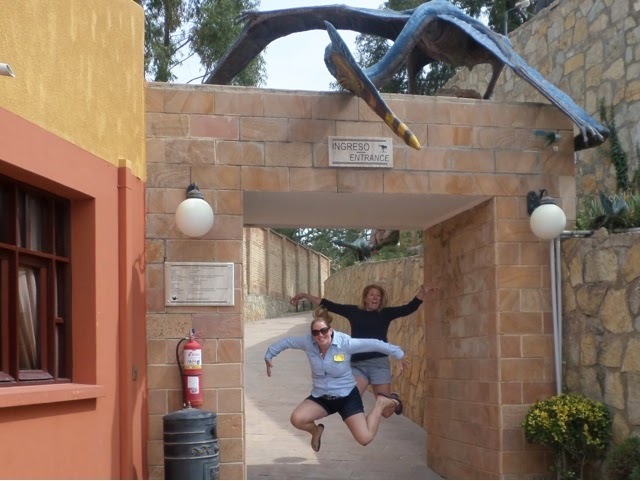 Me and Michelle attempting to be flying dinosaurs…. We headed off to try and find an open cafe for lunch and wound up back at the travellers cafe as nowhere was really open. I had a yummy cheese burger, despite trying to avoid dairy. The afternoon was spent doing admin making the most of having internet access in a week. You realise how reliant you are on technology, especially when you rely on it for your banking! Although I am the kind of person who greatly enjoys the chance to turn my phone off! I am also an enormous hater of people who take their phones out with them everywhere and log onto every Wi-Fi possible am then just sit online or messaging home, as this goes against the point of travelling to me but hey ho I guess that’s an old persons opinion! Tomorrow morning I am heading off to Potosi which I think will be really interesting as it has such a dark history even by South American standards. You can still visit the mines which I am really interested to do. The last night in Sucre was memorable, but unfortunately not for positive reasons. We headed to what seemed to be an upmarket French-Bolivian restaurant for dinner. The menu looked great and we were all really impressed by the food and great wine when it arrived. I had beef wrapped in bacon stuffed with spinach and Roquefort cheese, it was definitely the best beef I have had as it was cooked to perfection. It all went very sour when one of our group realised they had a small human tooth on their plate!!!! How the hell does that happen! It was totally gross and sickening. The chef was at a total loss to how it got there too. It was quite upsetting for the recipient who needed a moment, unfortunately when I went to go and check on them my trousers got torn open on a screw which was sticking out of the wall! What a dodgy place! Also very annoying when you’re travelling with very limited clothing and you have to walk back to the hotel with your arse totally hanging out of your pants! This entry was posted in Travel and tagged Bolivia, Cathedral, Chocolate, church, Dinosaurs, Donkey, Easter, Footprints, Fossil, Iglesia SanDomingo, Intrepid, mass, Parque Bolivar, South America, SouthAmericanAdventure, Sucre, Travel, UNESCO, zebra. Bookmark the permalink.